More than once I have tried to picture myself in the position you are in right now but cannot since my house was not the one riddled with bone tearing and iron breaking bullets nor did I witness the terror unleashed on your whole household that snuffed out many innocent lives. The nature and magnitude of this terror cannot be accurately described since your whereabout still remains a mystery. A mystery that has inevitably impregnated my mind with bone-shilling thoughts; so scary that I yield to any distraction to keep my mind free from them. For I want to continue to believe that air still runs down your lungs and blood still moves in your arteries and veins. Even as I contemplate what your condition presently is, even as my imagination flutters back and forth, my mind is fixated on the revolutionary fire you have set that tunnels through all nooks and crannies. Your indomitable courage is indelibly ingrained in my mind as a reminder of a man persuaded and led by power beyond the atmospheric enclave. A transcendent power. It does not only engulf him completely but shields his eyes and numb his senses against the turbulent wind of fear that is ever present and strikes with incurable paralysis. You have shown to be a man whose mind is sophisticatedly layered to fend off the relentless impulses of doubt and hold strong to that stance, that belief, for which men of mental construct of a rare genre live and die for. I am not a member of your camaraderie. Even so, your message of Biafran actualization and liberation made a deep impression upon me and I concur even as the sinuous road to it lengthens and the hills grow into rocky mountains. It is a reality that the means to achieving a great thing as a shining city on the hill, a treasure trove of peace and joy, a land of equity and justice, could be herculean and frustrating and more so fraught with diverse dimensions of danger. But the very thought that it shall come to pass is about the same as being in paradise. For one thing, I do not and will not idolize a man, but I know a man of uncommon mental and spiritual configuration when I see one. You are a man of extraordinary giftedness who understands that the situation of his people is as critical as it is possible to imagine. As your message dominates the airwaves, it resonates with many, whereas many others consider it the worst onslaught that has ever been loose upon Nigeria. Therefore, the latter trump up charges of grandiloquent harangues and rhetorical flimflam against you. They see your rhetoric as a sign of your faulty moral character and antisocial mentality. They feel wounded and have every right in the world to make their side of the story as believable as possible. To a degree I see reasons with their feelings, but in view of the underlying reasons for your style of operation, I have no doubt as to the harmlessness and genuineness yet effectiveness of your message. Your message may have come across as aggressive and divisive, but in it, nevertheless, are trappings of methods. Generally, your message has always been within the paramters of vindicating the honor of your people faced with the worst and cruel political establishment. And So completely and quickly does your message makes a great deal of impact as soon as the wave picks it up. Frankly, it leaves glimpses of hope in the minds of the masses. It nurtures them to health — those that toil tirelessly all day and at sunset go home with only a meal for the night. Most specifically, those whose children cry in a stereotypical silence of the voiceless; cries unmistakably detected through their melancholy facial expressions and malnourished and lethargic body frames. Their cries are not for the money to celebrate their birthdays, neither are they for the upkeep of an extravagant lifestyle, nor buy nice clothes, but for food and education. More annoyingly, their cries are for justice and fairness. More than anything else, you have made the afflictions of your people yours and also your vicarious responsibility to stem them out. The very fact that you have stayed faithful thus far is an avowal of your devotion to this cause. By mere human understanding, the cause is a slippery slope from insanity to destruction. But the vision upon which it rests transcends all realms of negative energies. Those in disagreement often create a fantastic effigy of theirs and then pass judgment on you and your motive. Yet you are undeterred. You have shone light on all hidden things. The darkness is dispersed and the daylight is crowded with nakedness of different sort. The cabal cannot hide no more. So they are ‘pissed off’ as ‘hell’. Now the tail is wagging the dog. It is no more business as usual. Yes; I say more power to your elbow. Yet again, Nnamdi, my mind is troubled as your whereabout is still unknown. I see shadows of startling darkness when the imagination of your present state creeps into my mind. It is right down gloomy. I really wish not to think it so; in all honesty I do. But considering the bloodthirstiness of those that invaded your home, those murderous gangs of Nigerian army, the most brutal and ruthless set of creatures, the outcome can only be said to be anything but compassionate. Be that as it may, you are a revolutionary icon; a paragon of change. If it happens that you have called it a quit, though I sincerely hope not, we will surely continue from where you left off. 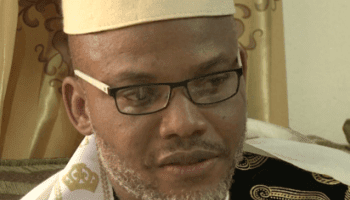 Show me one intelligent Igbo man, I choose Nnamdi Kalu. We Biafrans are utimately proud of you OHAMADIKE....Victor from Poland. He's a great man and Biafra hero. No matter has happened to him or where he’s held by the zoo, he has already set Biafra people free from the murderous sharia Islamic republic of Nigeria. He has destroyed the hellish country with truth. He'll never be forgotten. He’s my hero and a great leader!